Are you decorating your home on a budget? 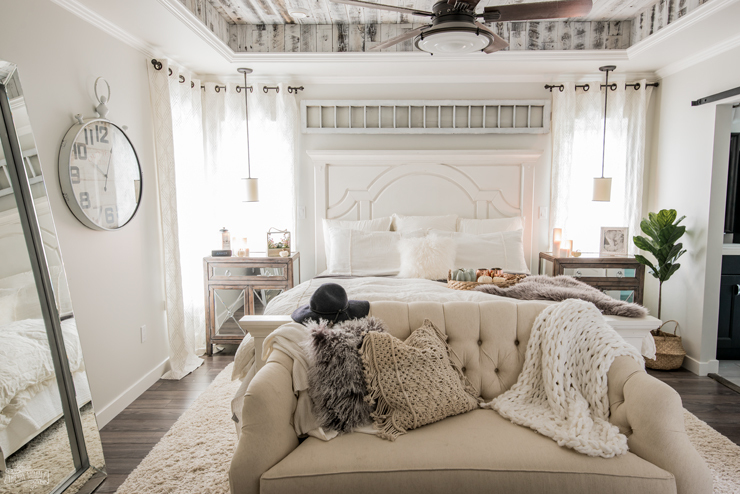 These 5 no cost home decor ideas are free and so easy to do! We often think we need a boat load of money to give a room in our home a makeover. It’s not true! 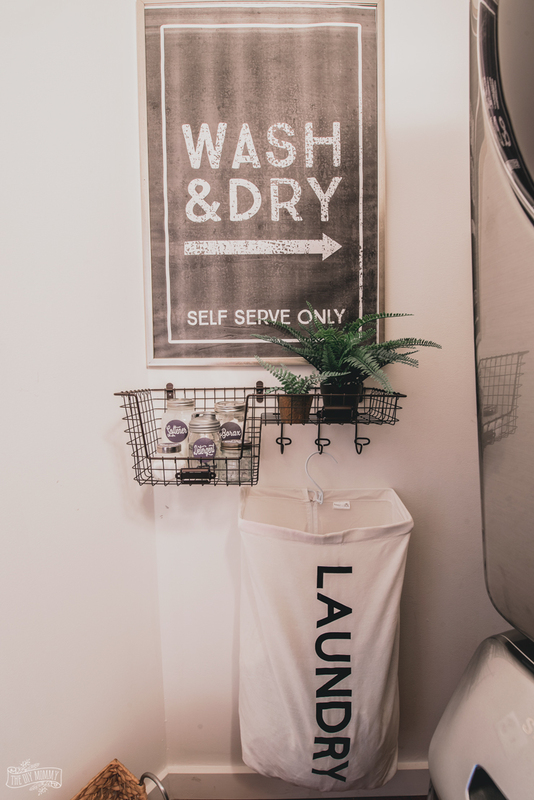 You can definitely refresh your home with little to no budget with a few simple tricks. 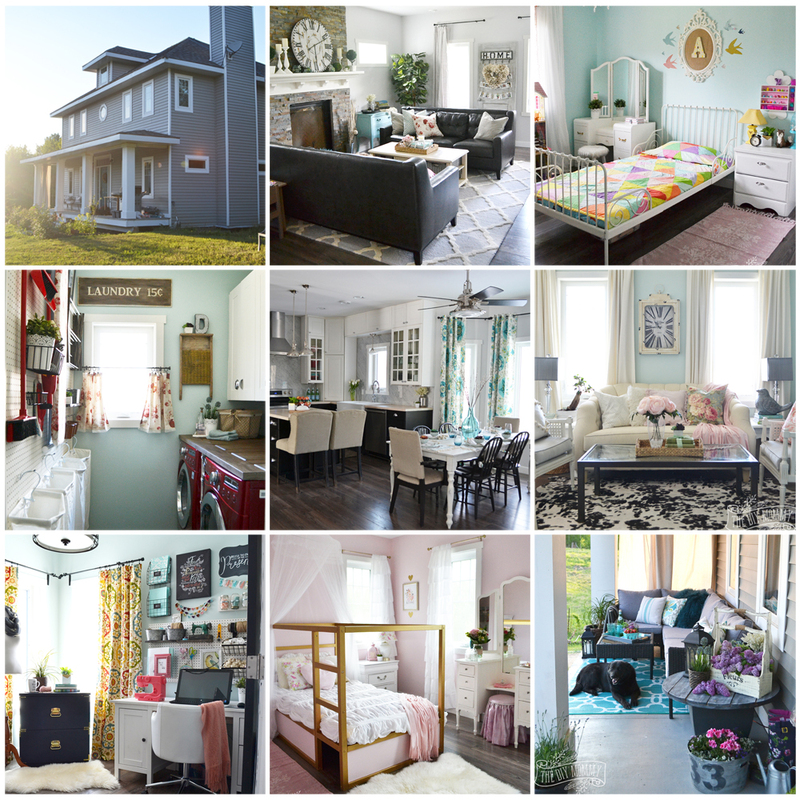 I love these ideas for giving the rooms in my house a refresh when the budget’s next to nil! Our settee was in our dining room, but I love how it looks now in our bedroom! Moving furniture or smaller decor accessories from room to room (or even from one side of a room to another) can make a huge difference in the look of your home! Try swapping rugs or moving a sofa from one wall to another. You might be surprised at how different your home will look with simple changes using things you already have. 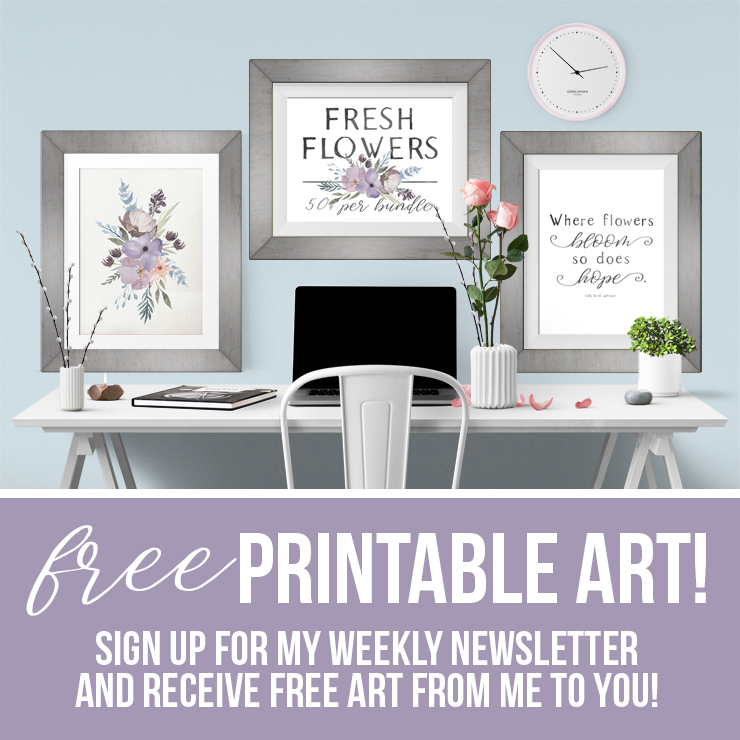 I love using free printable art and no-copyright vintage art online in my home. You can find so many beautiful pieces that you can easily print at home, frame, and hang on your walls. You can find all of my free printable art right here, or check out my Pinterest board here for more fabulous free printable art resources. You might be surprised at all of the potential decor you can find in your recycling bin! I especially like to use glass jars as decor objects in my home. 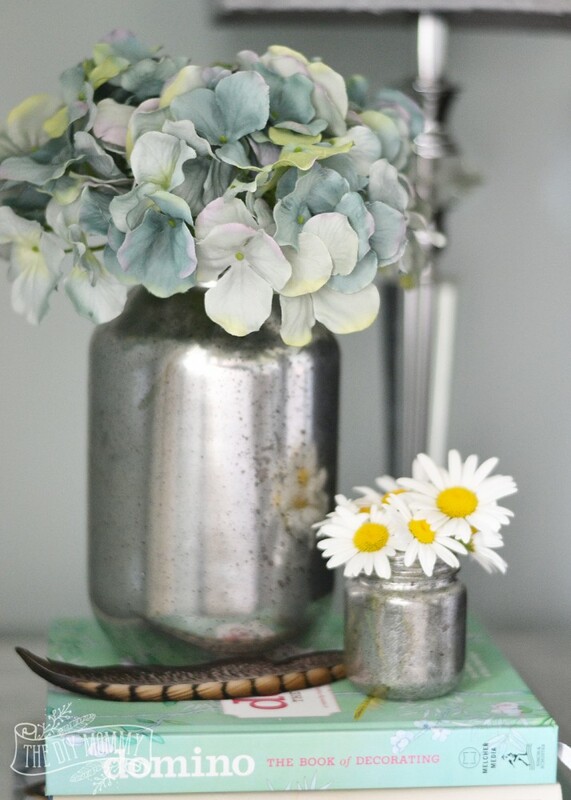 Turn a pickle jar into a mercury glass vase with some mirror spray paint, or turn baby food jars into spice jars with some paint and free printable labels. You can also use plain mason jars as craft supply or office supply holders. Nature is so beautiful, so why not bring it inside for seasonal decor? 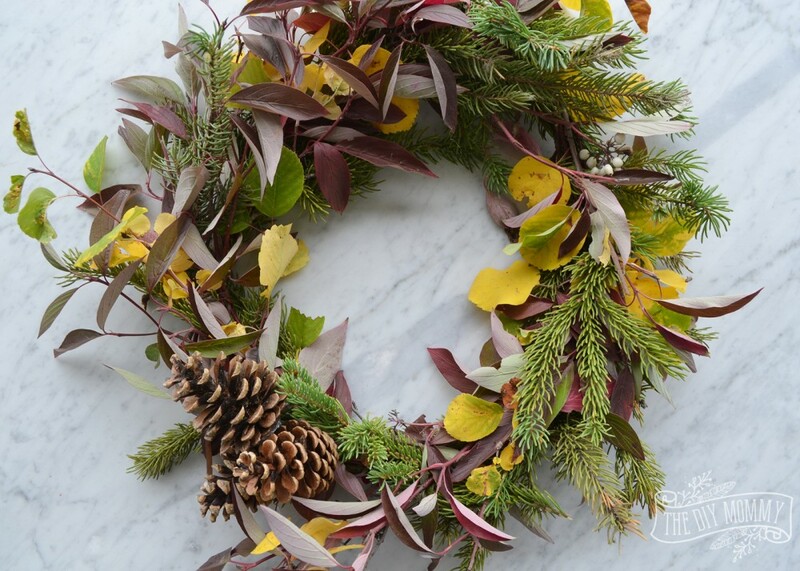 I love using branches in vases in the summer and Fall, and pinecones and evergreen boughs can make beautiful Winter decor like these DIY evergreen wreaths. 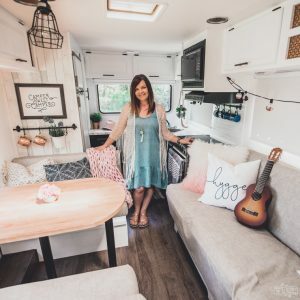 A great way to bring a new item into your home without really spending a dime, is to sell something you have on a buy-sell site, and then use that money to buy something new (to you)! If you have a piece of furniture that you’ve outgrown or don’t love any more, sell it on a site like Kijiji or Facebook and then look for another used item that works better for your home. You can also often find people giving away furniture and decor on those sites for free! 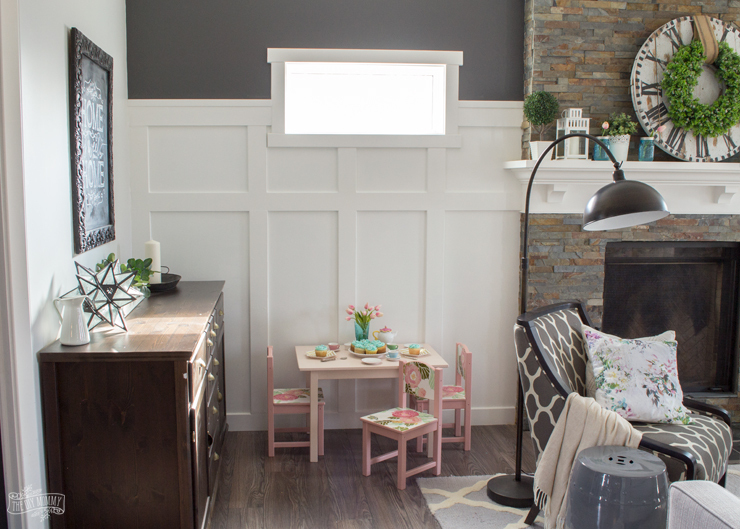 These are some of my favourite ways to change up my decor for little to no money. It’s so fun to be creative on a budget! Now tell me: How do you decorate your home for free? I’d love to get your tips and ideas! The dollarstore is my best friend for seasonal decor. I’ll spend under $10 and get flowers of whichever color/season to decorate all over – whether on a wreath or in a vase. Another cheap thing I’ll do is change my pillow covers on my couch pillows. You might spend a little bit of money to buy new ones but you’ll store them away and use again and again each season. 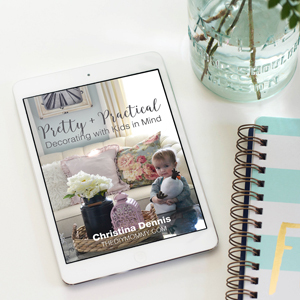 My kids also love to craft so we do cheap, but classy crafts that I’ll love to show off in my home! Your tips were great! I might move some furniture around today! Hi Christina, thanks for the blog. The decor ideas you have given, are amazing. I really like it. Keep sharing! Thanks for the great tips! I really liked it. Always having a hard time on how to redecorate our house without spending money. Amazing ideas. I like the points what you have described. Applicable ideas. I will also try. Thanks for this post. These are some great ideas. Thanks for sharing. Cynthia Walker recently posted..How To Install Wall Mounted Electric Fireplace In 5 Easy Steps? Totally unique idea Christina. I really like your tricks about no coast home decorating ideas. I think it will help people like me who really don’t want to spend money on decorating their home at the moment. Thank you so much for sharing such a unique article. Love from Sarah. I’ve actually looked at dozens of home decor ideas and most are just not cool. I find these list awesome and useful at the same time. Thank you for taking the time to put them together. Great DIY Ideas and tips!! Definitely going to save some money and try it myself! Thanks!! The furniture in the house looks nice and sturdy. Such good design and material i assume. I have long been looking to make home improvements and i was looking t o take help of professional which involves huge cost. You article really saved me some bucks. Thank you for sharing this. Home is that bit of living space which you can call our own. You spend your leisure time there and share the most intimate and loving moments with your family. Therefore, it is important to decorate and embellish your home in the best manner.